For his last interview of the year, President Obama sat down, exclusively, with CNN’s Candy Crowley to discuss North Korea’s cyber-attack on Sony Pictures, normalizing relations with Cuba, Russia, Iran, race relations in America and Guantanamo Bay. 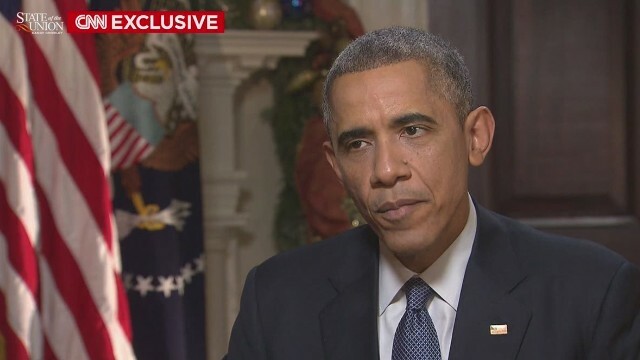 President Obama on Sony Pictures decision to pull ‘The Interview’: “Well, look, I was pretty sympathetic to the fact that they’ve got business considerations they’ve got to make. And, you know, had they talked to me directly about this decision, I might have called the movie theater chains and distributors and asked them what that story was. But what I was laying out was a principle that I think this country has to abide by. We believe in free speech. We believe in the right of artistic expression and things that powers that be might not like. Full Transcript available after the jump. CANDY CROWLEY, HOST: First of all, happy holidays. BARACK OBAMA, PRESIDENT OF THE UNITED STATES: Happy holidays, Candy. CROWLEY: — and said he didn’t think you understood what actually happened, that Sony was committed to putting the movie out, but the movie theaters came to them and said, yes, we’re not going to run it, that he’s not had a digital entity come to him to ask that, listen, how about putting it on YouTube and he said, maybe. He said he was kind of disappointed in what you said. OBAMA: Well, look, I was pretty sympathetic to the fact that they’ve got business considerations they’ve got to make. And, you know, had they talked to me directly about this decision, I might have called the movie theater chains and distributors and asked them what that story was. And if we set a precedent in which a dictator in another country can disrupt, through cyber, you know, a company’s distribution chain or its products and, as a consequence, we start censoring ourselves, that’s a problem. And it’s a problem not just for the entertainment industry, it’s a problem for the news industry. CNN has done critical stories about North Korea. What happens if, in fact, there is a breach in CNN’s, you know, cyberspace? Are we going to suddenly say, well, we’d better not report on North Korea? So the key here is not to suggest that Sony was a bad actor. It’s making a broader point that all of us have to adapt to the possibility of cyber attacks. We have to do a lot more to guard against them. My administration has taken a lot of strides in that direction, but we need Congress to pass a cyber security law. We’ve got to work with the private sector and the private sector has to work together to harden their sites. But in the meantime, when there’s a breach, we have to go after the wrongdoer. We can’t start changing how we operate. CROWLEY: — that — there’s that threat right there that — that people are looking at their theater thinking, you know, anything happens here, I’m — I’m done. OBAMA: You know, that’s possible. But, look, as I said, you know, the Boston Marathon suffered an actual grievous attack that killed and maimed a number of people. And that next year, we had a successful a Boston Marathon as we’ve ever had. You know, sometimes this is a matter of setting a tone and being very clear that we’re not going to be intimidated by some, you know, cyber hackers. And I expect all of us to remember that and operate on that basis going forward. CROWLEY: Do you think this was an act of war by North Korea? OBAMA: No, I don’t think it was an act of war. I think it was an act of cyber vandalism that was very costly, very expensive. We take it very seriously. We will respond proportionately, as I said. But, you know, we’re going to be in an environment in this new world where so much is digitalized that both state and non-state actors are going to have the capacity to disrupt our lives in all sorts of ways. We have to do a much better job of guarding against that. We have to treat it like we would treat, you know, the incidence of crime, you know, in our countries. OBAMA: But that’s something that I think we can manage through, as long as public-private sector is working together. CROWLEY: So let me move you on to the other big story that we’ve had, and that is your reach out or Cuba’s reach to you and your reach to Cuba. Listening to the critics, part of this is they wrap it up in how you dealt with other sort of bad actors. Oh, this is what he’s done. He’s accommodated Syria by not crossing the red line. He has accommodated Iran by talking to them on nuclear weapons. You know, and sort of down the line, Russia — he’s allowed Putin to move in and take Crimea. And here’s the gist of it. The gist of it is that you’re naive and they’re rolling you. OBAMA: Yes. So this was said about Mr. Putin, for example, three or four months ago. There was a spate of stories about how he is the chess master and outmaneuvering the West and outmaneuvering Mr. Obama and this and that and the other. And right now, he’s presiding over the collapse of his currency, a major financial crisis and a huge economic contraction. That doesn’t sound like somebody who has rolled me or the United States of America. There is this knee-jerk sense, I think, on the part of some in the foreign policy establishment that, you know, shooting first and thinking about it second, uh, projects strength. I disagree with. We have been very firm with respect to those countries that we think are violating international law or are acting against our interests. But I have been consistent in saying that where we can solve problems diplomatically, we should do so. You look at an example like Iran, over the last year and a half, since we began negotiations with them, that’s probably the first year and a half in which Iran has not advanced its nuclear program in the last decade. CROWLEY: — that they have not. OBAMA: — we — that’s not just verified by the United Nations and the IEA — IAEA and ourselves, even critics of our policy like the Netanyahu government in Israel, their intelligence folks have acknowledged that, in fact, Iran has not made progress. So Cuba offers us an example of an opportunity to try something different. For 50 years, we’ve tried to see if we can overthrow the regime through isolation. It hasn’t worked. If we engage, we have the opportunity to influence the course of events at a time when there’s going to be some generational change in that country. And I think we should seize it and I intend to do so. CROWLEY: Another question on something that I think this year, is I’ve watched you. I remember I was — I was watching you answer some Ferguson questions and some New York questions and I just remembered back to the day when Reverend Wright gave a press conference at the press dinner. CROWLEY: And you came and gave a — a very — I thought you seemed angry, certainly upset, news conference and were very forceful in pushing back on some things. And a question that I think arises to me, as people say, well, he’s in a very special position. CROWLEY: And so much is expected of him. And I thought, you know, do you think that you look at race matters somewhat differently because, yes, you’re the first African-American president, but your mother was white. CROWLEY: You were raised by your mother and your white grandparents. CROWLEY: Does that give you a different perspective, do you think? OBAMA: I think it probably does. I — you know, I wrote a whole book about this. And, uh, there’s no doubt that, you know, I move back and forth between the racial divides, not just black-white, but Asian and Latino and, you know, I’ve got a lot of cultural influences. I — I think what it does do for me is to recognize that most Americans have good intentions. I said a little bit about this in the press conference earlier today. I assume the best rather than the worst in others. But it also makes me mindful of the fact that there’s misunderstanding, there’s mistrust and there are biases both overt and sometimes hidden that operate in ways that disadvantage minority communities. And that’s a carryover. There’s a long legacy in this country that has gotten enormously better, but is still there. And when you look at what’s happened in law enforcement across the country over the last several years, um, that’s not news to African-Americans. What’s different is simply that some of it’s now videotaped and people see it. And the question then becomes, you know, what practical steps can we take to solve this problem? And I believe that the overwhelming majority of white Americans, as well as African-Americans, want to see this problem solved. So I have confidence that by surfacing these issues, we’re going to be able to make progress on them. And I wonder, does that come in to you, does that hurt? Do you think they don’t get me? I mean I — I feel like this is difficult to be president of all the United States and yet have so much expected of you. OBAMA: No, I, you know, if I spend too much time worrying about my critics, I’d be not getting a lot of stuff done here. You know, there’s no reason for folks to be patient. I’m impatient. That’s why in the wake of what happened in Ferguson and what happened in New York, we’ve initiated task forces that in 90 days, are going to be providing very specific recommendations. On the other hand, I think an unwillingness to acknowledge that progress has been made cuts off the possibility of further progress. If — if critics want to suggest that America is inherently and irreducibly racist, then why bother even working on it? I’ve seen change in my own life. So has this country. And those who would deny that, I think, actually foreclose the possibility of further progress rather than advancing it. CROWLEY: I have three quick questions which I think will be quick for you. The first is, will Bo Bergdahl face a court-martial? OBAMA: You know, that’s going to be up to our military justice system. That’s not something that the commander-in-chief gets involved in. CROWLEY: And you won’t — you won’t weigh in on that? OBAMA: I don’t weigh in on it. CROWLEY: Have you seen the report? OBAMA: Uh, it’s not something that I comment on or get involved with. CROWLEY: I’m going to take that as a yes. Will Guantanamo Bay Prison be closed down by next — the end of next year? OBAMA: I’m going to be doing everything I can to close it. It is a — it is something that continues to inspire jihadists and extremists around the world, the fact that these folks are being held. It is contrary to our values and it is wildly expensive. We’re spending millions for each individual there. And we have drawn down the population there significantly. OBAMA: You know, there are a little less than 150 individuals left in this facility. We are going to continue to place those who have been cleared for release or transfer to host countries that are willing to take them. There’s going to be a certain irreducible number that are going to be really hard cases, because, you know, we know they’ve done something wrong and they are still dangerous, but it’s difficult to mount the evidence in a traditional Article 3 court. You know, so we’re going to have to wrestle with that. But we need to close that facility and I’m going to do everything I can to close it. CROWLEY: Right. You want them here in a super max, right? OBAMA: I — I think that it does not make sense for us to spend millions of dollars per individual when we have a way of solving this problem that’s more consistent with our values. CROWLEY: And, finally, will you put North Korea back on the list of states that sponsor terrorism and will you take Cuba off? OBAMA: We’re going to review those through a process that’s already in place. We’ve got very clear criteria as to what it means for a state to sponsor terrorism. And we don’t make those judgments just based on the news of the day. We look systematically at what’s been done and based on those facts, we’ll make those determinations in the future. CROWLEY: And the — do you lean a direction of those? It seems given what North Korea — what we know North Korea has done in terms of its cyber attacks? OBAMA: I’ll — I’ll wait to review what, you know, what the findings are. CROWLEY: Right. And it would be hard to have relationships with Cuba, wouldn’t it, if they were still on the terror (INAUDIBLE)? OBAMA: But a — but we’ll take a look at it. OBAMA: In the meantime, Candy, I want to say congratulations on an extraordinary career. CROWLEY: Thank you very much. OBAMA: The — you will be missed, but I’m sure you’ll be doing some interesting stuff in the future and I hope we’ll get a chance to interact again. CROWLEY: I hope so, too. CROWLEY: I appreciate your time.